While there will always be moans and complaints about the tinkering of rules in any major sport, it appears as though the NBA has announced a rule change that is being applauded by many people in and around the sport. The new regulations aim to expand the area that has to be kept clear surrounding the basket. There will also be steps take to minimise the number of photographers that take up space around the baseline. These steps have been taken in order to improve the level of player safety, something which has been called for by many parties in recent times. These regulations are asking for an additional foot to be kept clear on either side of the stanchion of the basket. The new regulations were transmitted to teams on Tuesday of this week, with the Associated Press picking up a copy of the regulations. There may be some in the press who feel put out by these new regulations, especially with the fact that it may limit the number of photographers and great pictures that can be used to promote the game but in the end-up, it is far more important for player safety to come first. While it has been claimed that these new regulations have been lined up for a while, there is no doubt that the horrific injury suffered by Paul George in an exhibition game for Team USA will have had some impact. The Indiana player broke his leg when he came crashing down into a stanchion while on duty for the national team. The picture of George crumpled in a heap has reinforced the need for safety and space in the part of the basketball court and there are unlikely to be too many complaints about these changes. The space in the “escape lanes”, the term given to the space found either side of the stanchion, will move from 3 feet to 4 feet. There will now only be 20 positions for cameras at the courtside, with 10 on each baseline. This is a small reduction from 24 which was the case last season, and a big reduction from the total of 40, which was the case in the 2010/11 season. Teams will be able to allocate six spots for photographers on one side, while they will only be able to provide 4 spots on the other. There will be no access to the baseline for entertainers or dancers. There have been concerns about players crashing into a bank of photographers when they stumble or fall out of bounds. The NBA undertook an experiment in minimising the number of spaces on offer in the play-off games of last season, and the findings of this has impacted on the new changes. 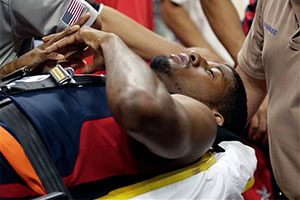 It is not as though the injury suffered by Paul George was related to the presence of photographers, but in light of the injury and the loss of the player to his team and Team USA, it is understandable that there is a focus on improving the safety levels in the sport. 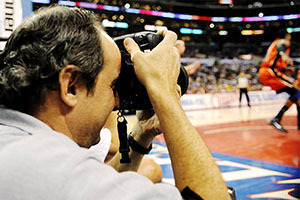 While reducing the amount of photographer coverage is a hindrance, it is important to remember that basketball teams have a massive investment in their players. Safeguarding this investment is paramount to the owners and backers of the clubs, not to mention the sponsors, so you can expect there to be a continued increase in improving safety around the court. When clubs offer out million dollar contracts to players, they want to ensure that the players are fit and ready to play as often as they possibly can.